These authentic die stamped, 18 gauge (.048in) cold rolled steel panels match all of the contours, thickness and details of the original floors found in '97-'06 Wranglers. 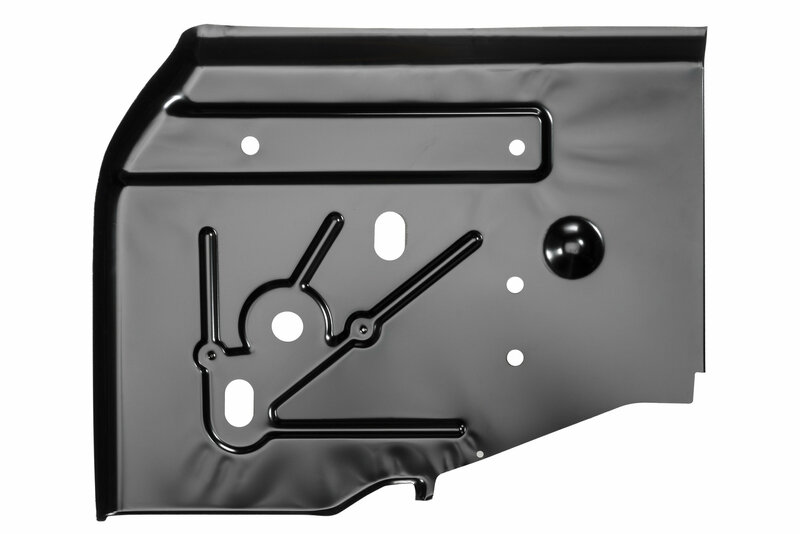 These panels include welding flanges, the correct drain plug holes, e-brake cable hole, etc. They even include the factory lip to run under the firewall depending on how much coverage you need. These also extend up the sides of the transmission tunnel and up the face of the seat riser for a complete floor restoration. Panels are EDP (Electrophoretically Deposited Paint) coated for a durable rust inhibiting finish. These are far superior to any hand formed pieces currently on the market and are the only die stamped floor replacements available. These floor panels maintain the correct angles and shape through the entire fitment process saving countless hours with superior results. 1. Cutting and Welding Required.